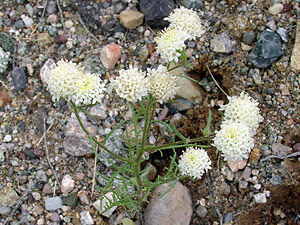 Description: The rayless flower heads have enlarged outer corollas and are 3/4 inch (1.9 cm) across. The leaves are slender, green, and 1-2-pinnate with 4 to 8 main lobe pairs. 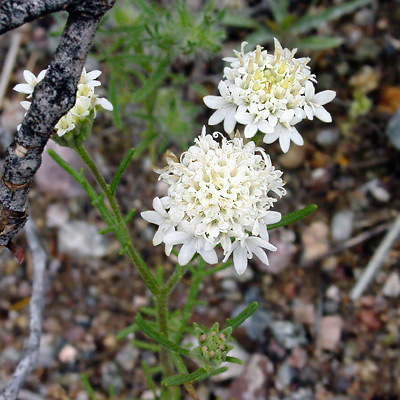 The similar Pebble Pincushion (Chaenactis carphoclinia) and Bighead Dustymaiden (C. macrantha) have barely enlarged peripheral corollas, while the similar Pincushion Flower (C. fremontii) has 0-1-pinnate leaves with only 1 to 2 lobe pairs.